What you get in the Baby Bullet kit! 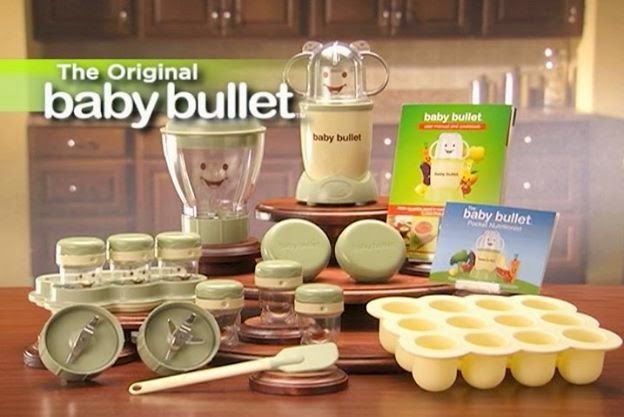 The Baby Bullet is a great addition to the family when you have a little one! I was really excited to give this a try! I mean I want my baby to eat healthy and to be honest now a days who really knows what is in the jars of baby food? I like that I can make and "add" my own ingredients. I feel like a safe mother this way! The Baby Bullet works wonders! It does each stage right, blended perfectly! I would highly suggest you giving them a try! You can store a weeks worth of baby food at once in the cups provided and have perfect meals blended up for baby. Start with applesauce that seemed to be Sierra's favorite! Be sure to check out Free For All on Facebook we are giving a Baby Bullet away now! I would love to have this. I am making my grand daughters baby food in my food processor, though it works, it is just way to big for making baby food.